Fly Fishing Guide Service and Lodging Accommodations On The West Branch. Deposit, NY has been a special place for my wife Laurie and I, having met and grown up here years ago we are well accustomed to the area and it is where we make our home. In my youth I was enamored with the great outdoors and during my waking hours I could either be found out on the stream fishing or in the woods with a gun in hand. To this day I am still awestruck by God's great creation and can be found taking advantage of it, whether guiding clients on the Upper Delaware river fishing for wild trout and smallmouth, Steelhead on the Great Lakes trib's or just enjoying them all with some friends on my time off. I also still enjoy my time out in the woods - bow or gun in hand in search of some good table fare. After retiring from law enforcement we settled back into the Deposit, NY area with our children and promptly made our home on the West Branch of the Upper Delaware. Needless to say, the river was calling me and shortly afterward I developed a strong desire to guide people and share this magnificent tail water that produces excellent bug hatches and World Class Wild Trout. Our business provides an Upper Delaware river guide service on the East branch, West Branch and Main stem as well as lodging accommodations on the West Branch near Deposit, NY. In addition to the Upper Delaware river, we also provide walk/wade guide trips on the Catskill rivers; Beaverkill, Willowemoc and Neversink river. We provide a very professional and friendly service as attested to by our largely repeat guests/clients. As a long time fly fishing guide my desire is to share my knowledge of this great fishery using traditional fly fishing methods as well as spey casting with both single handed rods and the newly popular switch & spey rods. 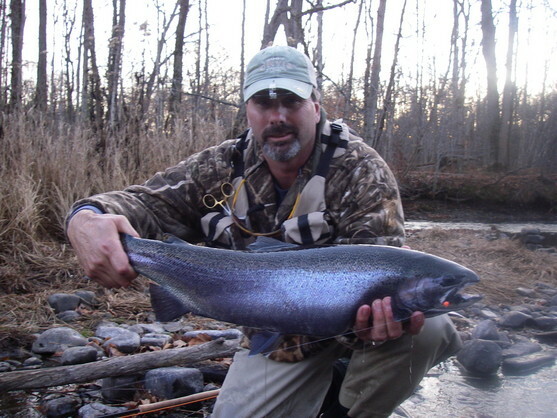 Upper Delaware River Guide Service with fly fishing guide Wayne Aldridge, offering float and wade trips as well as lodging accommodations on the West Branch of the Delaware near Deposit, NY. Also offers fly fishing and casting instruction with single and two handed rods. Copyright © River-of-Life Outdoor Adventures 2011. All rights reserved.